UAE power tools market registered a healthy growth during 2014-17 attributed to increasing construction market as well as governmental spending on infrastructure development projects. UAE Vision 2021 and Abu Dhabi Vision 2030 would positively affect the growth of construction market, further boosting the deployment of power tools over the coming years. However, upcoming new commercial and residential projects coupled with increasing automotive sector and surging need for automation are some of the key factors which would further drive the market over the next six years. Also, for upcoming World Expo 2020 more than $15.41 billion is expected to be invested by the UAE government for the expansion of existing and construction of new public and private infrastructures resulting in an increase in deployment of power tools in the country. According to 6Wresearch, UAE Power Tools Market is expected to grow at a CAGR of 7.2% during 2018-24. A healthy growth is anticipated during the forecast period on the back of increasing demand for power tools in the construction, manufacturing, aerospace and automotive industries. Within power tool types, the metal power tool segment accounts for the highest market share due to increased utilization in industrial and residential sectors. According to Shefali Goel, Senior Research Analyst, Research and Consulting, 6Wresearch, within technology type, electric power tool segment accounted for major share of market revenues. Growing acceptance of cordless power tool sub-segment owing to improvement in batteries and increase in productivity led to growth in demand for electric power tools. "Moreover, advances in building construction activity and durable goods manufacturing is expected to spur the demand for power tools in the country," Shefali further added. According to Gurbani Kaur, Research Associate, Research and Consulting, 6Wresearch, "In the overall UAE power tools market, construction vertical accounted for major market share. UAE is registering significant infrastructural development activities in the commercial sector. Surging construction projects in residential sector, would further stimulate the growth of market during the forecast period. "Further, the Northern region accounted for major share in power tools market due to huge sale of vehicles and growing infrastructural projects in Dubai," Gurbani concluded. Some of the key players in UAE power tool market include- Robert Bosch, Hitachi Koki, Makita, Atlas Copco, Techtronic Industries, Metabo, Hilti and Stanley Black and Decker. "UAE Power Tools Market (2018-2024)" provides in-depth analysis with 42 figures and 5 tables covered in more than 100 pages. 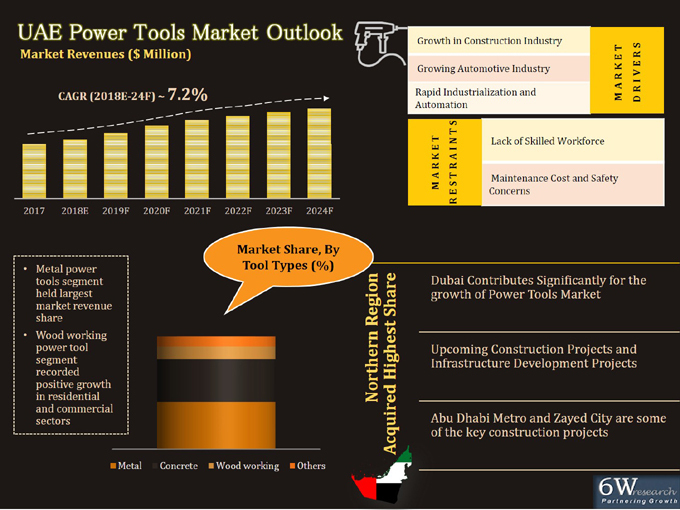 The report estimates and forecast the overall UAE power tools market by revenues, types, technology, regions, verticals such as construction, automotive, manufacturing and aerospace. The report also offer insights on competitive landscape, market share by companies, companies benchmarking, company profiles, market drivers, restraints, and recommendations. 6Wresearch is the premier, one stop market intelligence and advisory center, known for its best in class business research and consulting activity. We provide industry research reports and consulting service across different industries and geographies which provide industry players an in-depth coverage and help them in decision making before investing or enter into a particular geography. Aurion Options Silasselkä Vanadium Project to Strategic Resources Inc.